Adoption has been in practice since centuries. Earlier, members of the royal families were often heard to adopt a child of royal lineage in order to gain a natural successor to the throne. For many years now, the practice of adaption has infiltrated the lives of common men and women, and we now have many people around us- either single, married, or in de facto relationships- who adopt and raise a child as their own. In recent times, we see celebrities adopting children from various parts of the word to much fanfare, along with common people who do it much more quietly. However, adoption is still a controversial topic, with many people of the opinion that giving birth is infinitely more preferable to adopting a child from an unknown set of parents. Yet, it cannot be denied that adoption is certainly one of the most humane things a human can do. Read on to find out why. First of all, when you adopt, be it a human child or an animal, you are practically giving life to a living being. You are giving them a family, and making a promise to take care of them and protect them from the harshness of the world, no matter what. You welcome them to your world and give them love and shelter, something all creatures need the most in this world. If nobody adopts, there will be millions of children and animals in the world who would be without a home, and would not know a day of love or a single kind word. In short, there will be millions of living beings who would not really live with the warmth they deserve. 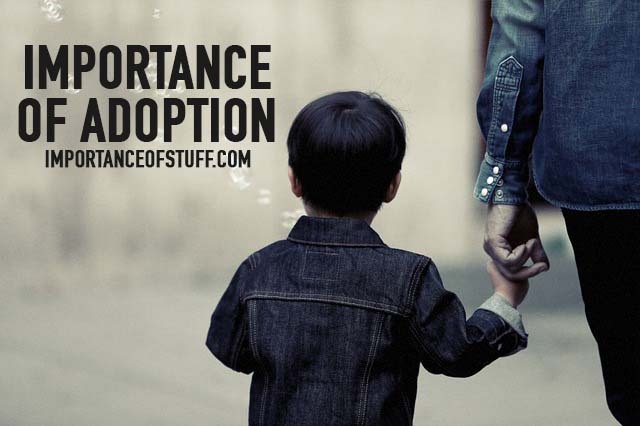 Adoption gives a child the scope for living a normal life, and the possibility of growing into a responsible citizen with a lot to contribute to the world. Children who never get adopted are left to fend for themselves when they reach legal adulthood. In developed countries, welfare systems are in place to take care of these people and provide them with jobs to support themselves. In less developed countries, however, these adults have nothing to look forward to. Moreover, in such countries, many of these children do not even grow up in orphanages, but simply on the streets, fighting for survival every day. There is really nothing for them except to take underhand measures for survival; the girls either get trafficked or join prostitution rings of their own accord upon reaching adolescence, and the boys often get sucked into a life of crime. Needless to say, this is plain wrong. Having a child is, for many people, one of the greatest joys life has to offer. And you can get that joy even without actually giving birth to the child. Adopting a child is actually often a trickier and far more rigorous process than conceiving, which makes the child, if possible, even more precious. And the same goes for adopting an animal. You are welcoming someone in your life who is completely vulnerable to the harshness the world has to offer, and giving them a loving home and supportive family. Be it a human or an animal, you are giving them the hope that there will be someone to take care of them through the ups and downs of life. If the possibility of changing the life of a person or an animal forever does not appeal to you, the idea of adoption is still good, for your sake at least. There is no saying when you will need the help of another – be it animal or human. There might be illnesses you will have to deal with, which would be impossible to manage without a helping hand. Old age is not an easy time for anyone, and having a child you cared for and raised well will ensure that you have someone to take care of you when you are too old and unable to do so properly. An animal, when adopted, showers you with unconditional love and support; their whole life literally revolves around you. Few joys in life are as wonderful as coming back home to loving cries and wagging tails, and adopting children and animals will give you just that: the feeling of loving and being equally loved back. No matter what the arguments are against adoption, it really is one of the best things that you can do, for yourself and for a homeless creature. So, if you are unable to conceive, bring home a child who is already n this world and has nowhere to go, and adopt an animal from the local shelter to give them a loving brother or sister.